In addition to our monthly newsletter the Murrumbidgee Field Naturalists have produced several other publications which are available to the public. Travellers to the region may also find copies of the brochures and field guide available at the Visitor Information Centres in Narrandera, Leeton and Griffith. Birds of the MIA - A full-colour brochure with detailed information about 20 of our favourite birding spots in the Narrandera, Leeton and Griffith LGAs. Includes notable bird species that can be found at each site, and a map of the region with each location clearly marked. Click on the image to download a PDF copy (3.7MB). We also have several glossy hardcopies available - contact us if you'd like some for your group. 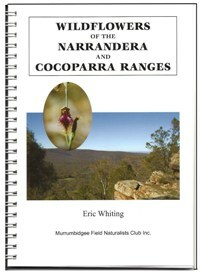 Wildflowers of the Narrandera and Cocparra Ranges - This valuable local field guide was developed by MFN member Eric Whiting. The field guide is available as an A5-sized printed, bound book with a sturdy yet flexible cover and glossy pages - perfect for slipping into your day pack when heading out for a ramble, or keeping in the glovebox of your car or ute.